Mainly as a result of the 2004 tsuanmi, many local community groups have been set up to help recovery and generate local income. Her Royal Highness Princess Chulabhorn Mahidol saw to the construction of new houses for those affected in a new community development. She gave the new name, Baan Nam Sai, (meaning clear water) to this Lam Kaen community, located at Moo 2 Tambon Lam Kaen. Ban NamSai is close to Ban Khao Lak. A small local group, mainly housewives, have set up the Seafood Processing Group in order to create an income-generating, local industry for tsunami affected villagers. The processed seafood includes dried squid and dried fish. Lam Kaen means 'river of strength' . The river implies the centre of the community. Hence the name really means 'centre of strength'. The main occupation of the Lam Kaen sub-district is agriculture, such as rubber tree farming, palm tree cultivation, orchards and garden crops. But coffee trees have been planted here since 1997. Due to stagnant coffee prices, the group decided to set apart their coffee and make a brand to add value to the product. The result was the Thung Tong Ancient Coffee Product made of fresh Robusta coffee beans, which are traditionally planted. 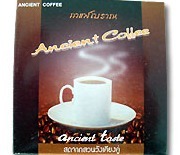 This ancient coffee product is aromatic and full of robust flavour, and it has been registered for copyright. Back in the days of 1980 and 1984, Baan Nanai Tung Mapraow was awarded a first-prize for Example Village. This group produces and sells artificial flowers made of stocking. The attractive properties of these artificial flowers are natural colors, durability, and ease of care and cleaning. The products are sold within the community and also distributed to many events and festivals, such as the Turtle Releasing Festival, and the Provincial Governor Road Show. The group produces various kinds of flowers, such as orchids, lilies, carnations, lotus blossoms, roses, and jasmine. These villagers work in agriculture and fishery. Din Daeng means 'red soil'. Baan Tha Din Daeng has the potential to serve as an alternative getaway for tourists who seek a more eco-focused adventure in a pristine, natural environment. This community offer tours rather than homestay. Nonetheless, tourists are certain to appreciate observing and learning about the traditional way of life from a native Tha Din Daeng villager during the tour. The tours cover:- swimming in Nayak mountain area, hydroponic vegetable plantation visit, community forest visit, old tin mine site visit, white snapper fish farm, longtail boat trip to see mangrove forest, community forest plantation, batik workshop, rubber tapping. Three kinds of chilli pastes are produced: Spicy sour curry, black curry and spicy red curry. The chili paste costs 80 Baht per kilogram and most of the products are sold within the community. The group was formed by Tsunami survivors in response to the diminished levels of income generated by the rubber tree plantation and tourism during the rainy season. The group has been trained in basic batik-making skills by the Department of Social Development and Welfare and then introduced to sewing by the Department of Skill Development. The group’s products continue to evolve and the members continue to hone their craft-making skills. Bang Khaya batik is unique because of their exotic lines and pattern techniques. Furthermore, there is an artist who produces abstract work on a parquet that reflects the sorrow and sense of loss resulting from the Tsunami disaster. This group of agricultural housewives feature on batick, and chilli paste. This group, with funding, have set up a Dock and Pier for small fishing boats (long tail fishing boats), and is known as the Lam Kaen Fishing Pier and Boat Repair Centre. These fishermen traditionally use long-tail boats for fishing. They rely on simple equipment such as ring nets, rattan traps or simple fishing rods to haul in their catch. The group consists of local fishermen from Baan Tha Din Daeng, Baan Tao Tan, Baan Thap Lamu, Baan Bang Niang and Baan Khao Lak. This Centre facility helps to restore stability in the lives of those affected by the Tsunami, and provides the fishermen with a safe and cost-effective place to dock and repair their boats, unload fresh fish and eventually attract tourists. During the tin mining era in Baan Pakpu, the Chinese imported their traditional bamboo hats to protect workers from the sun and rain. Later, Pakpu villagers began using a local material, Bai Rom Khao, for the hats, instead of bamboo. The Bai Rom Khao hat is much more durable due to its long, tapering, sticky, sturdy leaf. It lasts for at least two years, whereas the bamboo ones only last for about eight months. In 1997, the community organized a Bai Rom Khoa hat-making workshop in the Kapong district. More recently Bai Rom Khao hats now come in more designs. The range has also been expanded to include many types of baskets, lamps and souvenirs (in miniture form). Baan Nanai Bangthong group was developed in 1999 by the Bank of Agriculture and Agricultural Cooperatives. It is registered as a community enterprise. The group produces three kinds of chilli paste:- spicy sour curry, black curry and coconut milk curry. Most of the ingredients are bought locally. This Batik group was founded in 2006. Their batik and batik products are: cloth, fisherman pants, handkerchiefs, t-shirts, scarves and picture frames. The group was founded by Mr. Sobe Sompon in August 2007. He was inspired by his father who was a boat builder. For the previous two years he worked alone initially using basic tools until he was funded to acquire more professional equipment. Currently, the group constructs many kinds of local boat models - eg. local fishing boats, barges, minesweepers, dredgers, etc. The products are guaranteed Thai Community Product Standard. Historically the bullrush plant has been made into household products such as mats and rice baskets for decades. It is now being made into more decorative wares and souvenirs, and their product line has evolved according to market demand. Currently, the group produces bags, mats, baskets, and place mats. Product development is based on local customs and uses contemporary motifs, resulting in high-style, local products.